Preparing for Medical Studies – 30 Future Students Take Part in the Crash Course! Preparing for Medical Studies – 30 Future Students Take Part in the Crash Course! Our Crash Course Natural Sciences, this year, is already at full swing, and we are very happy, that 30 participants are again preparing for medical studies in our course. The course is the second one this year and, as always, filled to capacity! Since two weeks, the future medical students diligently review the basics of the natural sciences biology and chemistry in English – physics is going to take place next week. This will help those, who have already obtained a university place, to make the start of studies significantly easier, because the course contents deliberately overlap with the syllabus during the first semesters. All others, who did not get a university place until now, will have greater chances for getting a place, because in the course you cannot only prepare for medical studies, but also for admission exams of German and international universities. After our last course in March, all participants were able to obtain a university place for studying medicine. We are looking forward to the last week and wish all participants a nice time in the course and especially in Alicante. For all of those who stayed home and have not participated this time: Do not worry! There will be two courses next year! 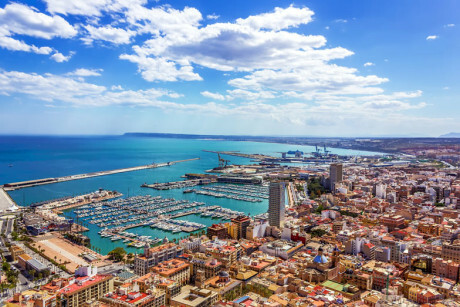 Until then, you can increase your anticipation with this picture of Alicante! 0 responses on "Preparing for Medical Studies – 30 Future Students Take Part in the Crash Course!"